Norfolk- Jessie Sullivan of the Light Team attempts a layup while being defended by Ben Moxness of the Dark Team during the All-Star Game Friday night in Norfolk. Former Boone Central/Newman Grove all-state standout Jessie Sullivan poured in seven points in the final two minutes to help the Lights defeat the Darks 96-88 in an entertaining 35th Annual Northeast Nebraska All-Star Basketball Game Friday at Northeast Community College (Norfolk). Sullivan finished with 17 points and nine rebounds, earning Outstanding Player honors for the victorious Lights. The Light team used balance, with seven of nine players scoring in double figures, to offset a 26-point performance by Winnebago grad D’Von LaPointe, Outstanding Player for the Darks. 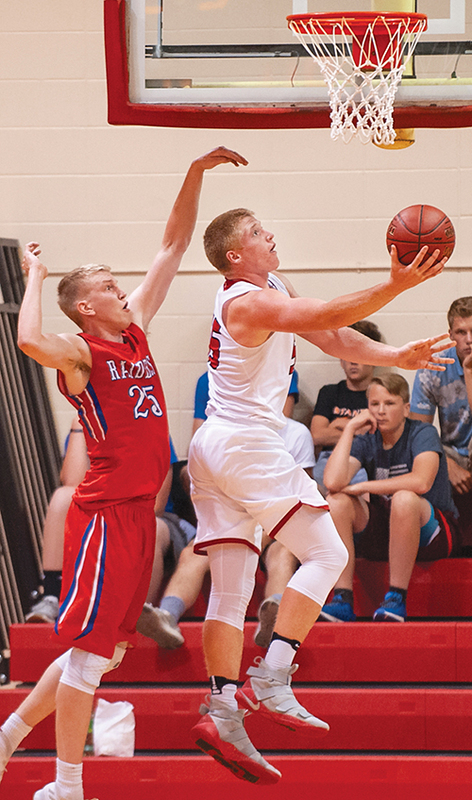 Sullivan was able to enjoy the All-Star experience and victory with former Cardinal teammate Dylan Gentrup, who had eight points, four rebounds and three assists for the Lights.